Whenever I’m asked what type of “energy bar” I recommend for snacking, I say that the best way to get energy and satisfy hunger is to eat a handful of nuts, not a bar. Nuts are high in protein, fiber, healthy fats, vitamins, minerals, enzymes and antioxidants—all of the necessary components of a healthy balanced meal. And according to new results from two long running Harvard studies published in the November 21, 2013 issue of the New England Journal of Medicine, that handful of nuts will likely add years to your life by cutting your risk of cancer, heart disease, stroke and respiratory disease. And if you eat a handful of nuts every day, you’ll likely keep the pounds off too. The researchers found that people who ate nuts every day lived longer, healthier lives than people who didn’t eat nuts. The most obvious benefit was a reduction of 29 percent in deaths from heart disease — the number one cause of death in the United States. But they also saw a significant reduction —11 percent — in the risk of dying from cancer. The findings were collected over 30 years from the 120,000-person Nurses’ Health Study, which has been following up with volunteers since 1976, and the Health Professionals Follow-up Study, involving more than 50,000 men and dating back to 1986. Participants were asked every few years how often they had eaten a serving of nuts: never or almost never, one to three times a month, once a week, two to four times a week, five or six times a week, once a day, two or three times a day, four to six times a day, or more than six times a day. 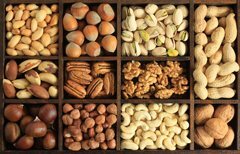 The findings showed that people who ate just one ounce of nuts a day seven or more times per week had a 20 percent lower death rate from a variety of causes such as heart disease, stroke, cancer and respiratory illness. In all the analyses, the more nuts people ate, the less likely they were to die over the 30-year follow-up period. Just eating nuts every once in a while lowered the death rate by 7 percent over 30 years. Eating nuts once a week lowered the death rate 11 percent. People who ate nuts five to six times a week had a 15 percent lower death rate. And people who ate nuts gained less weight over time than people who didn’t, which shows that eating nuts does not necessarily pack on pounds. However, portion control is key. Eating too much of any food can affect weight loss efforts. As a good source of protein, healthy fats, vitamins, minerals, fiber, and several potent antioxidants, nuts are one of nature’s nutrient-rich foods. The study found that it doesn’t matter what type of nuts were eaten–almonds, walnuts, pecans, cashews, macadamia nuts, pistachios, etc—they all had life-saving effects. I always recommend eating nuts in their raw form, not roasted. Roasting nuts destroys their healthy fats and turns them rancid. If you have a difficult time digesting nuts it’s probably because they need to be soaked first. When soaked, nuts are ten times more nutritious and much easier for your digestive system to break down than in their raw unsoaked form. You can read more about soaking nuts here. Raw Mixed Nuts Unsalted - 30 oz.